Our extensive investment in research and technology pays dividends for our Customers. 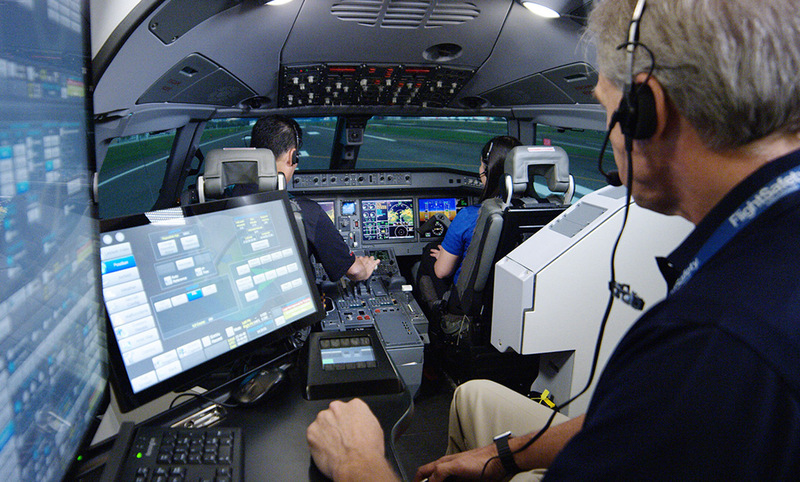 That begins with the FlightSafety-developed and manufactured FS1000 full flight simulator. The FS1000 outperforms current generation simulators in virtually all aspects. Its lightweight and highly robust modular design offers added configuration flexibility and ease of systems integration. That technology combines with the VITAL 1100 visual systems with its high-fidelity imagery to provide unprecedented training realism. Our CrewView all-glass mirror displays complement that detailed scene content with bright, high contrast and distortion free collimated images. MATRIX, our innovative suite of flight training tools, leverages all components to bring integrated simulation-driven training to the classroom and advanced task trainers. Our Level D-qualified full flight simulators support advanced audio, motion and visual capabilities. We build them to meet the industry’s highest standards. They provide a realistic environment for duplicating every phase of flight. Built at our state-of-the-art 375,000-square-foot facility in Broken Arrow, Oklahoma, our delivered simulators provide airlines an avenue to operate highly effective, cost-efficient training facilities. Our full flight simulators offer the highest level of realism in simulation, outperforming current generation simulators in virtually all aspects. The VITAL visual system is at the heart of an advanced-technology flight simulator. The VITAL visual image generation and display systems deliver unprecedented fidelity for a wide variety of uses with full flight simulators and a complete range of other advanced training devices. VITAL provides pilots with the out-the-window and sensory information needed to simulate aircraft operations and real-life missions. Well over 300 airport scenes are available in the VITAL visual database library to support your training needs. Providing superior optical performance and sharper image clarity, our CrewView all-glass mirror displays offer significant advances in fidelity and field of view. Their modular design produces the largest field of view available – up to 300 degrees horizontal and 60 degrees vertical. CrewView fills the entire aircraft window, eliminating ground rush distortions and allowing the greatest level of effectiveness in training. FlightSafety’s integrated learning system – MATRIX – brings the realities of the Level D simulator experience into the classroom and to other training devices. MATRIX consists of the DeskTop Simulator, Integrated Courseware and Graphical Flight-deck Simulator. This innovative suite of flight training tools features shared applications and graphics. We offer a full range of support services to our Customers. These include upgrades and modification to installed flight simulators, visual system upgrades and replacements, cockpit systems upgrades to reflect aircraft fleet changes and updates driven by regulation changes, such as the Directive 2 changes to the FAA CFR-14 Part 60.